SANTA ROSA, CA. A study published the prestigious Journal of Nervous and Mental Disease, the oldest peer-reviewed psychology journal in the United States, found that Emotional Freedom Techniques (EFT) lowered the major stress hormone cortisol significantly more than other interventions tested. In a randomized controlled trial (the gold standard of scientific research), 83 subjects were randomly assigned to a single hour-long session of EFT, talk therapy, or rest. Their cortisol levels were measured via a saliva test before and after the session. Cortisol is the “master hormone” regulating many aspects of the body’s stress response mechanisms. The researchers hypothesized that successful therapy would lower stress and that this would be reflected biochemically in a reduced level of salivary cortisol and psychologically in reduced levels of anxiety, depression, and other symptoms of psychological distress. The results showed that cortisol levels in the rest and therapy groups declined by an average of 14%, while the EFT group declined 24%. The decline in this physiological marker of stress was also significantly correlated with a decline in anxiety, depression, and other psychological symptoms as measured by a standard psychological assessment tool. The human body is designed to release cortisol only at times of physical danger, to help the body mobilize to fight or flee from that threat. The level of cortisol and other adrenal hormones such as adrenaline are supposed to subside when the danger passes. The human body is not meant to live in a constant “bath” of cortisol and adrenaline. Unfortunately, that is exactly what is happening to many people in today’s stressful world. Most are not responding to physical danger but to traffic, work worries, financial problems, and the myriad other stresses of modern life. Continually elevated cortisol levels are known to contribute to a range of physical and psychological problems, including fatigue, weakened immunity, anxiety, depression, digestive and metabolic problems, obesity, and even diseases such as diabetes, Cushing’s syndrome, and cardiovascular disease. EFT is a noninvasive technique that pairs the recall of emotional upsets (a form of exposure therapy, a common method in psychology) with physical stimulation of specific points on the body to discharge stress (as identified by thousands of years of use in acupuncture). 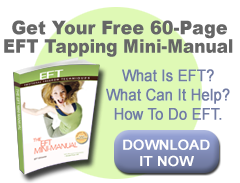 The physiological mechanisms of action of EFT have been documented in a number of studies and review articles. 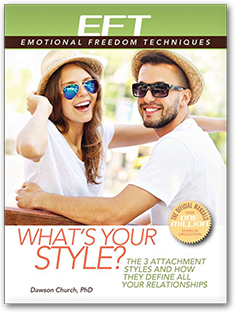 These demonstrate that EFT affects several of the body's regulatory systems, including the brain and endocrine systems. 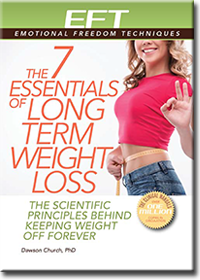 Unlike various drugs and supplements touted to lower cortisol, EFT has no side effects. And unlike the “cortisol blockers” that have flooded the market as the negative effects of elevated cortisol have become more widely known, EFT does not strip the body of cortisol’s precursor molecules, which are used for cell repair when we are in a relaxed state. coauthored the study with Audrey Brooks, PhD, of the University of Arizona at Tucson, and Dawson Church, PhD, of the Foundation for Epigenetic Medicine. 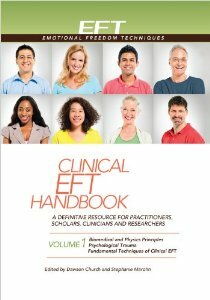 For more information visit the EFT research bibliography at EFTUniverse.com. To schedule an interview with Dr. Dawson Church, please email support(at)eftuniverse.com. For more information on this press release, please contact: Jennifer Ellis at (619) 713-6756.